Check Out These Pages, Too! Welcome to my Central Florida Garden Blog where we garden combining Florida natives, Florida-Friendly plants, and tropicals. I'm very excited about my new Taro plants. One is Midnight and I split the Illustris (above) to make two --planting them among the existing purple queen and lavender lantana. White caladiums should be popping up to surround these deep purple lovelies any day now. It's definitely one of my least favorite things on the "chores" list. But sometimes it has to be done before you can get to the fun part of gardening. Seems I've done it a lot lately and thought I was doing my best to avoid anymore of it for this season. It was not to be. I just couldn't get away from making one more bed just a little wider and just a little longer. While there is much being written in the blogosphere by northern gardeners elated to finally have some spring weather and rightly so, I am trying to beat the clock that is quickly moving toward the soon-to-come heat and humidity. There was a 'front' that moved through here last week which produced for us some divinely dry (no humidity) and cooler weather. At least the days start out that way in the mornings... up to 80's in the afternoons but very manageable gardening weather especially in the shade. SO... these last couple of weeks I have spent oodles of hours (read: days) in the garden. And it's a good thing because I'm still not completely finished with my 'project list'. Most of my new purchases needed a sunny home and there aren't that many options for full-sun around Hoe & Shovel. 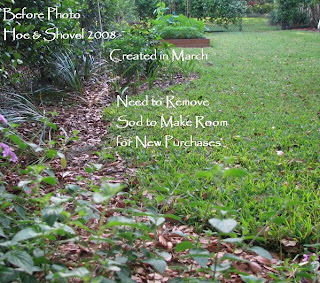 So here I go one more time ... finding it necessary to expand another bed which means digging out sod! Ugggghhh! This time the removal was only about 3 feet wide (@ the widest point) and about 12 feet long. Here's the rub... I had just a few weeks ago dug out part of this same area and planted what you see in the above photo. It just wasn't large enough .... already. which will give them morning sun-- then later in the day ---filtered sun. 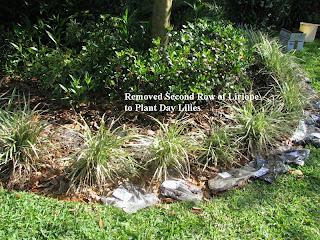 It was necessary to remove a border row of variegated liriope to make room for them. Don't worry I made a new border in my new expanded bed with what I dug up. All this bare root ordering/planting is completely new to me. 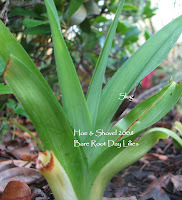 When the on-line seller says bare root --- they mean bare root... root with barely any green growth. It's sort of a learning thing so what I've decided to do is divide up each variety and plant them in completely different spots in the garden. Then I can determine where they do best. I figure surely some will survive and then I'll know under what conditions which plants succeed. (Look closely at the photo to see the slug that already found this brand new growth on one of the day lilies- I was actually taking the picture to show how quickly the greenery is shooting up-- in just 4 days) I'm happy to report some of the lilies and irises already have new growth sprouting out (above photo) after only a few days in the ground. I think enlarging this bed was worth the trouble. 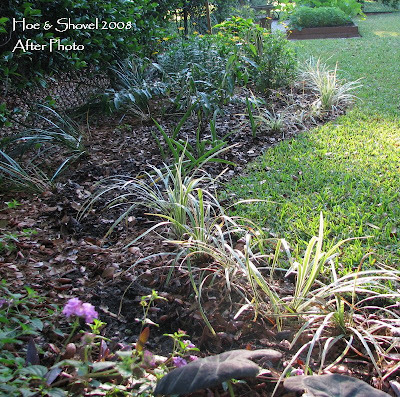 It has a much nicer flow giving the overall side-yard area a more complete look. Also as you can see from the opposite-angle-photo below it lends itself to blending/continuing better with the front side-yard plantings. Moved yellow Bush Daisies to group three together next to Fire Spike. Moved Butterfly plant next to bush daisies. Planted 1 white yarrow (also given to me at the library talk) Much of what I've planted is new to me. Isn't that exciting ? I've definitely stepped out of my comfort zone. There's lots of potential for color bursting forth with maturity and growth here in the next months of the growing season. I'm certain to give updates as the blooming begins! When I bought two of the hydrangea it was my intention to put them together in the very back side of the garden. They will get quite bushy and tall. Instead I put one in the front under the oaks and among the azaleas and palmettos and one in the back. I just had to have one that I could see as I come and go out of the driveway. I moved several other plants around in the back gardens and made a new bromeliad bed I'll include in a post sometime in the future. After digging the sod it's all fun stuff from there. Oh what a busy girl you have been! Isn't it quite the domino game when you move things about! 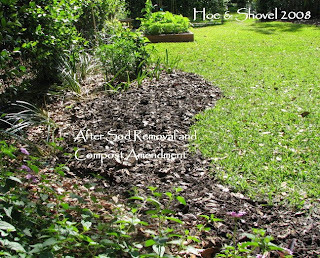 A friend calls it the unintended consequences, but then she doesn't garden and sees it differently than we might. 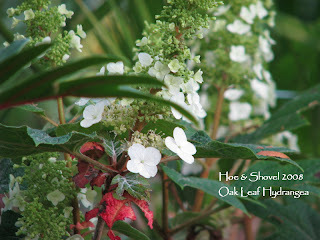 The sun or shade issue is a big one even in Tennessee, I want the shade for those hot summer days, but it does create a need for a shade happy plantings. That is one reason I grow wildflowers; they bloom when the trees haven't leafed out. Meems, it looks so lovely, really inviting and pleasant. Meems...I know what you mean about hurrying to get everything done in the garden. It won't be long before summer arrives with a bang and then I'll be enjoying the garden from the pool where it will be much cooler:-). I've got one bed left to get trimmed back and I need a couple more bags of mulch. 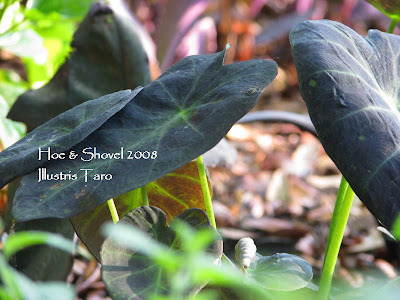 I love those black taro plants. That should be a beautiful combo. I've never heard of hurricane lilies - what do they look like? We get hot days here in summer, but it's always very, very dry. Our evening and mornings are almost always cool, even in the height of summer. When I go anywhere with humidity I think I'm going to die. I can understand why you would want to get the bulk of your gardening work done now! 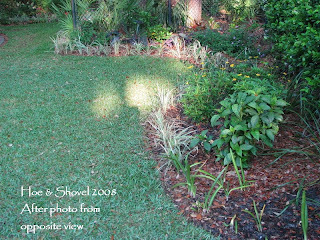 I widened some beds last year and now I think they need to be enlarged again :) Plus I have more sod to remove. Ugh. I hate that part too...what a job it is. 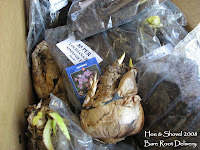 I bought bare root plants for the first time this year and started them indoors. *Amazing* how fast the green growth came in. I'm very excited! I'm with you... gotta have the shade but now days I find myself looking for sunny places for those sun-loving plants I just have to have. Nancy: I think I now have every variety & color of lantana. The one you noted is new to me (last year). It is so bright and vivid next to the purple blooms of the butterfly bush and the purple of the indigo spires... I'm really enjoying the results. Susan: I LOVE it that you know what I'm talking about.Next month I should really wrap things up as far as projects and all that's new should be well-established. Then it is maitenance mode for the summer which is plenty enough right? You'll have to copy/paste... not sure how to back link for you. Have a great week/weekend. Amy: Hot just isn't the same when the air is dry... I can handle that kind of hot so much better than humid hot. You'd think I'd be used to it living in Florida all my life. I wouldn't want to give up our winters but our summers are something to stay away from if you can help it... I'll be in the pool. You've probably got lots of digging to do for your beds since you're just getting going good in your garden. Although my family keeps asking me if I'm going to have any lawn left. I love the lawn too but the beds are addictive. Hope you enjoy the rest of your week. I'm headed out of town until late Friday night. You've certainly been busy. The only problem I foresee is that eventually you'll have no more sod to move! Meems this is exciting. My gosh I think about what wore me out today and then read all you have done. Gee I feel like a weeny. A friend of mine gave me 2 starts of Black Magic Elephant Ears which look similar to your Taro. I hope they grow. Wow... you have Black Magic... yes it is a taro too. I started out looking for Black Magic but ended up with Midnight which is supposed to be an even deeper shade of the lovely purple. I got the Illustris to plant next to it. Fell in love with the lime green stems and veins. I hope yours does do well for you ... I'll be curious to see how you use yours. LOVE them for the deep shade of purple and for the unique size and shape... AND so tropical looking. Oh can you tell I could go and on about them? One thing that really jumps out at me when I come to your blog is how organized you are. I admire that. Your bed turned out very neat and attractive. I've got a more organized looked to my chois this year. I enjoyed the thought and effort you put in to the process. Your newly-enlarged bed looks lovely Meems. I can't wait to see what it looks like later in the season. Ugh, digging out sod! It's good exercise, I'll say that much. I'm still watching my lirope waiting for it to emerge. Rabbits ate the tops off immediately after I planted it late last summer. I hope that didn't sap the plants too much and make them fail. Maybe I'm just being a bit anxious since in years past I've had a lot of stuff not come back. So far this year, I'm amazed at how much has come back. It's so exciing! anna: I admit to being called "organized" all my life... it works well for me. I'm excited about seeing all your new containers at your new house. Hey Meems, I always suspected it was true...and I am glad you had the courage to post about it! Hee Hee hey, skip over and check out my BIG NEWS! I need to rest after only reading your recent post.....I too am dreading the approaching heat and humidity but I'm not complaining.It's the trade off for having perfect weather like we had today....The taro you mentioned is such a beautiful plant with its giant bold leaves, excellent for creating contrast but you'll never convince me to enjoy eating it. You've gotten an amazing amount done! I will just warn you that I began by expanding the beds in my front yard and one day the last of the grass disappeared...one does what one must to find a home for needy plants! rees: definitely a trade off... I love my Florida. Leslie: my family already thinks I am on my way to giving up all the lawn... I won't b/c I love the contrast of the green lawn... even though beds are easier I think to maintain. Please Come Visit On Facebook. Click the *LIKE* button to join the conversation. Pushing the Zone – with Starfruit! 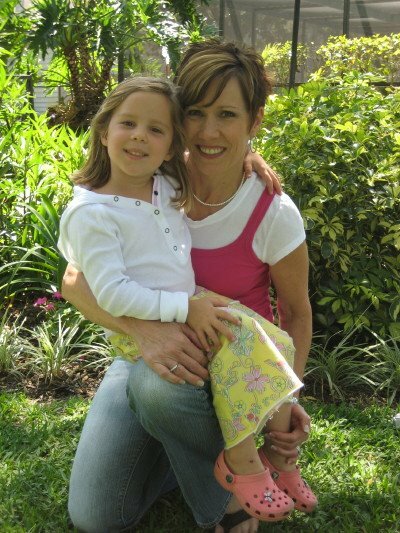 My Florida Garden Coach business is a proud partner of "Be Floridian"
Great big hugs all around to those who nominated and voted for Hoe and Shovel. Congrats to all the other winners, too. Click sidebar photos for links to related topic/plants. All photos are original to Hoe and Shovel and copyrighted. Please do not copy or download any photos without express written consent. All photos and text remain the sole property of Hoe and Shovel. O Lord my God, how great You are! You lay the rafters of Your home in the rain clouds. My photos are my own without the use of photoshop or 'fixing'... only an occasional crop. Found a picture pot for my Oncidium 'Sherry Baby' aka 'chocolate orchid' from Laura. This thing is doing so well. Here's how to subscribe via e-mail at the new site! Spring has sprung in my garden! Stumble Back In ... Can It Have Been THAT Long ?!! Unless authorship is otherwise noted, all text & photography is copyrighted © 2007-2014 and belongs to me... no copying, stealing or borrowing. Copyrighted Text and Photos by Meems. Picture Window theme. Powered by Blogger.